A Universal Christmas returns to Universal Studios Singapore with a full repertoire of experiences including dazzling light displays, all-new musical performances and spectacular fireworks. Park hours are extended till 9pm and 10pm on select nights, in addition to adrenaline-filled rides and world-class attractions at the theme park. Taking centre stage this year is Santa’s Snowy Sleigh Ride, which returns as the largest-ever Christmas parade in the history of Universal Studios Singapore. The colourfully flamboyant parade will feature a procession of wildly embellished floats and over 50 merry characters including elves, toy soldiers and jolly old St. Nick himself. At nightfall, the parade culminates in Santa’s Christmas Light-Up Party on New York Street, where guests can expect a brilliantly-illuminated show with stunning projection mapping, snowfall and favourite characters such as the Minions, Sesame Street friends, Shrek and Princess Fiona—all decked out in Christmas outfits! Over at the Hollywood Lagoon Stage, guests are invited to a brand-new production titled PRESENTation Day which tells the heart-warming story of Evie Evergreen, a toymaker elf determined to bring back the true meaning of Christmas in today’s tech-obsessed world. Follow the quirky cast of elves in this original musical filled with all-singing, all-dancing acts that will delight audiences. The yuletide celebrations continue throughout the theme park. Make A Christmas Date with Marilyn Monroe and sing along to familiar tunes, or dance along to the best holiday hits at the all-new Turntables show where guests can even pick the next song in the set list. The whole family can catch Oscar’s Grouchmas at Pantages Hollywood Theater and follow the story of Oscar, as he transforms from a Christmas grouch to the holiday’s number one fan. 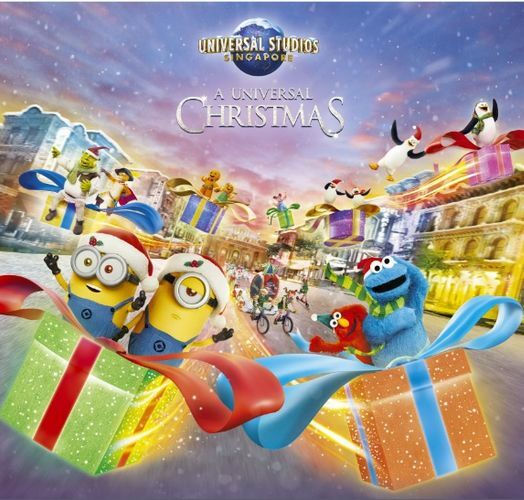 A Universal Christmas is included with regular admission to Universal Studios Singapore. Singapore Residents enjoy online discounts on admission for an adult one-day ticket, along with a limited edition EZ-link card and a complimentary S$5 retail voucher. Guest who wish to enter only after 5:00pm are eligible for a special package, with more details being available online.